The United Nations defines human trafficking as the "recruitment, transportation, transfer, harbouring or receipt of persons, by means of the threat or use of force or other forms of coercion, of abduction, of fraud, of deception, of the abuse of power or of a position of vulnerability or of the giving or receiving of payments or benefits to achieve the consent of a person having control over another person, for the purpose of exploitation. Slavery. Her pimps threatened to "throw away" her baby. "I asked him, because I had worked for such a long time, when I could pay off the money and when I could get my freedom, and he said it didn't matter if I had paid off the loan, he wouldn't let me escape. He said I am a kite in his hands. If he wants me to fly higher he will release the string, if he wants me closer he will take the string back." 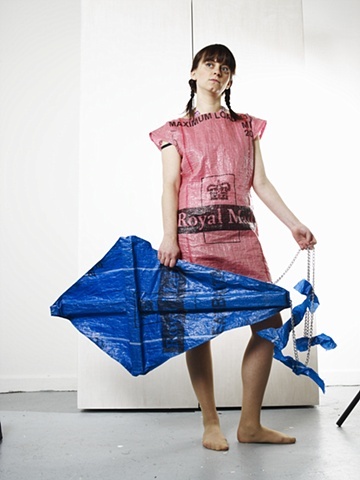 Materials include Royal Mail Bags, wood, heavy chains, a necklace of stamps, a portrait.